Christian Louboutin knows how to seduce a woman. 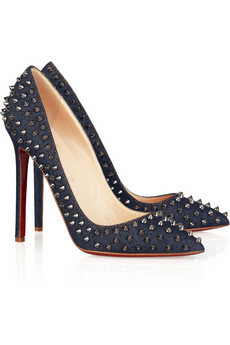 STUDDED DENIM PUMPS: Denim has replaced leather for a tamed look. Pair them with a solid tee, plain button-down, black blouse, tunic, studded or diamond earrings, your favorite gun-smoke necklace or bracelet (thin, chunky or layered), a denim jacket, shift dress, leather bottoms (skirts, pants and shorts), cargo skirt, cropped pants, anything in black denim is also a great combination. 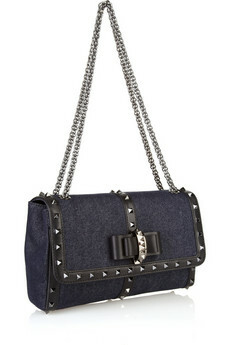 STUDDED LEATHER/DENIM BAG: I am obsessive about flap bags on chains; quilted, solid, leather, canvas, fabric, metallic, denim, anything goes. The structure of a flap bag is beyond clever, it’s immaculate, so it’s no surprise that the style is universally loved. What’s intriguing about this bag is how well it incorporates a rocker-edge, but overall still manages to appear subtle enough for daily use. Great for casual days at work or for the weekend.